The Rise and Fall of The Roman and British Empire Plus The Crusades: ( 3 books in 1 ) Triple The Action! 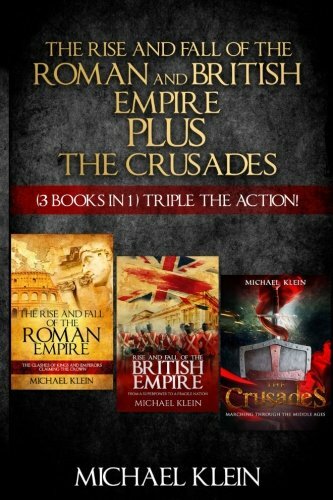 The Rise and Fall of The Roman and British Empire Plus The Crusades (3 books in 1) Triple The Action! How did we get here, to this time and place in history? Are we repeating history’s mistakes because we did not learn about the pivotal events that shaped the modern world? At fewer than 500 pages, this easy-to-read, three-book history course helps you quickly understand the nuances and the impact of three crucial periods portrayed in countless films: the Crusades and of the rise and fall of two great empires, the Roman and British. The culture, technology, law, and military organization of the Roman Empire shaped western civilization. Determined to spread their rule, the Romans succeeded magnificently until human nature and other factors led to the empire’s collapse. One reviewer noted, “The book is written in accessible and interesting language that will allow both novice and an experienced person in the field of history to understand ...” Were current relationships between Christians and Muslims determined when the Knights of the Crusaders rode off on their grand quest? “I was looking for a book which would have a good historical overview of the Crusades and have an objective approach to the underlining story of power struggle. The book by Michael Klein gives exactly that,” says Amazon reviewer Raven Heinrich. By the beginning of the 20th century, the British Empire and its superior navy claimed territory larger than that of any other empire in history, but its overreach foretold its downfall. This insightful and critically acclaimed history of the British Empire spans from the 17th century to contemporary time and combines comprehensive scholarship with readable popular history.